A tad late and likely unexpected, Eric Berry’s free agent tour begins Tuesday with the Dallas Cowboys. The key word in that development: Tour. This isn’t expected to be Berry’s only free agent visit, unless Dallas is offering a respectable top end safety deal out of the gate. A source familiar with the mutual interest between Dallas and Berry said Tuesday’s visit will be more of a feeling out process between the two sides, centered largely on Berry’s health and potential fit with the team. If both sides are happy with the results, talks are expected to advance into potential financial terms. But one thing is clear already after Berry was released by the Kansas City Chiefs last week: It’s too early to talk about the five-time Pro Bowler being a “bargain” signing in free agency. Especially with Dallas being his first visit and at least 10 teams still having more than $30 million in functional salary-cap space to work with. Although his free agency just began, Berry is believed to be looking for a team that offers him the best hybrid opportunity of winning while getting paid near the top end of the safety table. That’s a key reality, considering the safety market has been significantly raised this offseason by a trio of deals for Landon Collins (six years, $84 million), Earl Thomas (four years, $55 million), Tyrann Mathieu (three years, $42 million) and Lamarcus Joyner (four years, $42 million). The major hindrance for Berry is the signing of that foursome – along with a multitude of other safeties – has significantly narrowed the free agent demand at the position. Ultimately, that could dramatically impact the type of contract Berry is offered – not to mention the actual number of free agent visits available to him. While a one-year “prove it” deal appears to be very unlikely, it’s not out of the question until the rest of his market solidifies. How strong is Cowboys’ shot of landing Berry? In terms of where that market could go: There is a key comparison in that previous group of safeties that Cowboys fans should keep their eyes on. That would be Thomas, who was drafted the same year as Berry (2010) and will also be (like Berry) 30 when next season begins. After the Collins and Mathieu deals, Thomas landed his big contract with the Baltimore Ravens, despite a variety of health issues that impacted his past three seasons. Like Berry, Thomas missed the majority of last season, breaking his leg in a Week 4 win over the Arizona Cardinals. While the Cowboys might balk at the comparison between Berry and Thomas at the negotiating table, they can expect that general parallel to be drawn. It doesn’t mean Berry is necessarily expecting to land Thomas money, but he’s not going to come cheaply by any means, either. And that might be precisely why he’s expected to shop around before signing his next deal. The good news for Cowboys fans is Dallas is expected to get a good look at Berry’s health, which is believed to be trending up after he finished last season with Kansas City and learned he wouldn’t need surgery to square away a bothersome heel. 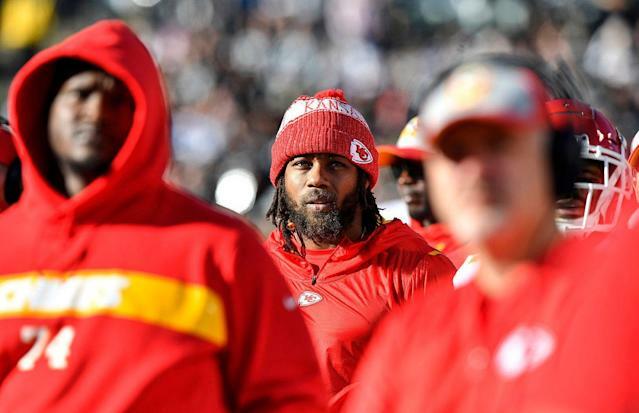 At the time of his release by the Chiefs, Berry was preparing to take part in all offseason activities and be 100 percent by the start of training camp.